Picking a subject for this post is very difficult because I have learned a lot regarding many different topics in science through this class. As a general topic, something that I have learned in this course involves mechanisms. More specifically, the fact that there is not necessarily a mechanism needed to explain why something works. For example, in class Andrew mentioned frequently that there was no known cure for Scurvy, but people noticed sucking on lemons made a positive difference. Nobody knew vitamin C was the solution until later on, but it still worked without an explanation for it. This has the ability to change my outlook on life because things can be true without having to know the reason behind it. For example, finding solutions to other types of life issues, falling in love, or making new friends. There are many unanswered questions in life and mysterious meanings behind relationships and discoveries. This class has opened my eyes to notice more about what is around me and not taking everything very literal. This entry was posted in Uncategorized on December 5, 2016 by Lydia A Chelli. Paper towels or Hand dryer? In class, we briefly discussed the hand dryer vs. paper towel controversy during one of our pop quizzes. The results of the design was the acceptance of the null hypothesis- that neither paper towels or air drying had an effect on the cleanliness of hands post washing. I decided to revisit that topic in order to see if there are any studies that contradict those results. Before we were quizzed on this subject, I was going to make it the topic of one of my blogs since it has been such a large part of my freshman year so far in the residence halls, which only have hand dryers. These hand dryers are very noisy and powerful, and have left many people on our floor complaining about their inconvenience and their wish that we had paper towels in our bathrooms. A study tested the difference between the two by having participants drying their hands with paper towels and two different types of air dryers- warm and jet. I imagine the jet air dryers are similar to those in the residence hall bathrooms. The results conclude that the jet air dryers spread the most germs and bacteria while the paper towels spread the least amount. There were flaws with the experimental design of this study. First, the number of participants and number of trials was left out of the report. These features are extremely important in determining if an experiment is well-conducted or not. Of course, there are many different aspects to this controversy that differ from the hygienic standpoint of it all. Air dryers are favored when it comes to cost and friendliness to the environment. According to the Washington Post, society favors paper towels over air dryers. In class we have learned the importance of meta-analyses which help show whether a conclusion is correct or not. If many studies have similar results, then those results are most likely not a fluke. The Mayo Clinic performed a meta-analysis regarding the topic of hand dryers vs paper towels and concluded that paper towels are the cleaner option. With that, this means there is a lot of data from various studies favoring paper towels. To conclude, we now know paper towels are the healthier option to dry hands with. Most people invest in hand dryers since they will save them money in the long run and are environmentally friendly. Unfortunately, for those of us living in residence halls, it is more difficult for us to make this switch since we cannot control the bathroom conditions. This entry was posted in Uncategorized on October 20, 2016 by Lydia A Chelli. Recently in my English class, we were assigned a project in which we have to think of something impossible to do, figure out how to do it, and do it. In terms of this assignment, the word impossible does not necessarily have to be taken literally; in fact, each member of our class has to think about their own personal strengths and weaknesses and think of something unique to them. Although I know this is not impossible to do, I decided to give up Netflix for three weeks because I find it takes up a lot of my time. While this is surely not impossible for me to do, I decided to take the challenge because it would help me focus more on my schoolwork. In the past few days, I have focused more on my schoolwork and found other pastimes instead of sitting in front of the TV. I wanted to learn if other people’s productivity is affected like mine is by Netflix. A fairly recent NPR article discusses a study performed by a doctoral student at the University of Texas. This experiment studies the effect of frequent television viewing on mental health. EurekAlert! writes about the same study, and includes more about the experimental design. There is not much of an experimental design. It is merely a report on people’s lives in order to look for correlations between the two variables. The participants had to merely answer questions about their habits and feelings, including how often they watch TV and how happy they are. In class, we have discussed the difficulty of measuring happiness since it is a self-reported variable and not a simple fact. With this poor experimental design, it is simple for the data to be skewed by avoiding questions that could be difficult to answer or try to maintain a happy image of themselves. New York University performed a study in order to see the affects of television on grades and study habits. This experiment had a good design because there was a large group of 500 students tested. The teenagers were then split into two groups: one group watched little or no television and the other group watched television frequently. Each group consisted of both boys and girls and the ages were 15-17 years old. In the end, the group with the lower television viewing performed better in various categories over the group who watched more television. This supports the researcher’s initial hypothesis that television does affect schoolwork. In terms of a college student, I imagine these results would be very different. Specifically, since we have more time and independence, we are not very good at time management, and the majority of students would rather be watching their favorite show that doing their homework or studying for the next exam. In the next few weeks, I hope that I will be able to manage my time better since I am not going to watch television. If I see someone yawn, I find myself yawning a few seconds later. This may appear to be an anecdotal observation, but I have commonly heard this occurrence in other people’s lives. In addition, it has occurred on many instances for me, and I am sure many people reading this are familiar with the topic. I wanted to do more research on this subject in order to see if there is any scientific evidence that supports my hypothesis that yawning is contagious. By the end of this post I will have hopefully found enough evidence to either accept or reject the null hypothesis. In terms of this topic, the null hypothesis is if yawns are not contagious and the alternative hypothesis is that they are contagious. Let us find out. Psychology Today mentions a study performed by Duke University in one of their articles. The study set out to determine the factors of contagious yawning and if this could mean more than simply fatigue. Here, the university implies that there may be hard endpoints, as in illness or disease, at play instead of merely soft endpoints, as in fatigue, that society believes a yawn displays. In the study, approximately 330 healthy people watched a three minute video of continuous yawning and about ⅔ of the participants ended up yawning at least once during the video. Before the experiment, third party variables were tested among the participants, which assures the audience about the unlikelihood that they could play a large factor in the results. The difficulty with this study is that it should be an observational study, but it was transformed into an experimental study for simplicity. The participants were gathered to a room and told to watch this video, but the study leaves out if they knew what they were there for or not. Some participants may have held back their instinct to yawn, if any, which could have distorted the data. In my opinion, for the university to get the most accurate results, they should have found another way to test this theory without manipulating the variable and leaving the results to nature. In addition, this study lacks a control group; in fact, a control group would be very useful in this study. For example, they could have had split this group in two and had one group watch the yawning video and one group watch a different video or nothing at all. With this, the results could be compared to a normal setting. On the other hand, three minutes is a pretty short amount of time and since ⅔ of the participants yawned at least once, it shows that the video of people yawning most likely had something to do with most of the group yawning at least once. Many believe that yawning may express more about someone other than if they are tired. Researchers at Baylor University set out to determine if a person’s compassion or sympathy correlates to contagious yawning. Before the study, the 135 participants (who are college students) took an in-depth test to determine each person’s level of compassion and sympathy for others. To me, these self-reported traits can be difficult to validate because people typically do not want to appear mean or standoffish. After the quiz, each participant was put in front of a computer screen and used headphones while watching various images flash across the screen. One of the images was a yawn, and the researchers recorded the number of students who would yawn at the sight of that specific computer image. In conclusion, the scientists did see a correlation between compassion and contagious yawns. In addition, they believe these results are valid. To me, with larger participants and more trials, this experiment would have been more effective. Although there is no known mechanism for why yawning is contagious and what can/cannot trigger a yawn, it is suggested that yawning is indeed contagious, and the null hypothesis is rejected. Do not be surprised the next time you find yourself yawning after you see someone else do it, and remember it is merely your instincts. With weather transitioning and the workload getting heavier the past few weeks, many students and faculty across Penn State’s campus have been getting sick. When I talk to my dad on the phone often, he hints that I should be drinking orange juice everyday in order to avoid getting sick. Within the past month, I have drank over two gallons of orange juice in order to avoid getting sick. With my experiences, I believe orange juice can prevent getting sick, but since this is merely an anecdotal observation and could potentially be a myth, I did more research to find out. According to Harvard Health Publications, the immune system acts as a body guard against germs and harmful bacteria. Although, vitamins must be consistently consumed in order to maintain the overall quality of the immune system. Therefore, if someone wants to prevent an illness, or the breaking down of their immune system, then one must take vitamins, drink juice, or other aliments that provide these benefits. This includes orange juice, which has a high percentage of Vitamin C in it, which ultimately improves the quality of the cells. Given these points, it is suggested that Vitamin C improves the overall quality of a person’s immune system. Moreover, a source suggests that oranges may be a better substitute to orange juice due to the added sugars in the juice. The chart below, from The World’s Healthiest Foods Organization, shows the nutrients found in oranges, including the high percentage of Vitamin C in one orange. Each bar represents how well the certain food supplies each source of nourishment. Although the orange juice diagram is not available on the website, it is explained how some of the nutrients in oranges are left out when orange juice is created. The article goes on to explain the additional benefits from oranges including heart benefits. To conclude, Vitamin C is and has been a vital nutrient that benefits us in many ways. In class, we have talked about the disease Scurvy numerous times and how there was no mechanism needed for why lemons cured it because it worked. We also discussed how later on it was learned that the Vitamin C in the lemon was the cure. With this blog post, I learned that orange juice is a good beverage to drink to maintain the quality of one’s immune system. However, if given the chance, one could substitute that for an orange in order to gain the nutrients that are commonly lost when producing orange juice. The dreaded communal salsa bowl. At a large gathering or party, who knows how many people have double dipped or even triple dipped?! It is a well-known idea that double-dipping is nasty and should only occur when there is only one person eating from the dish. I wanted to know more of the science behind double dipping and if it is worth it. 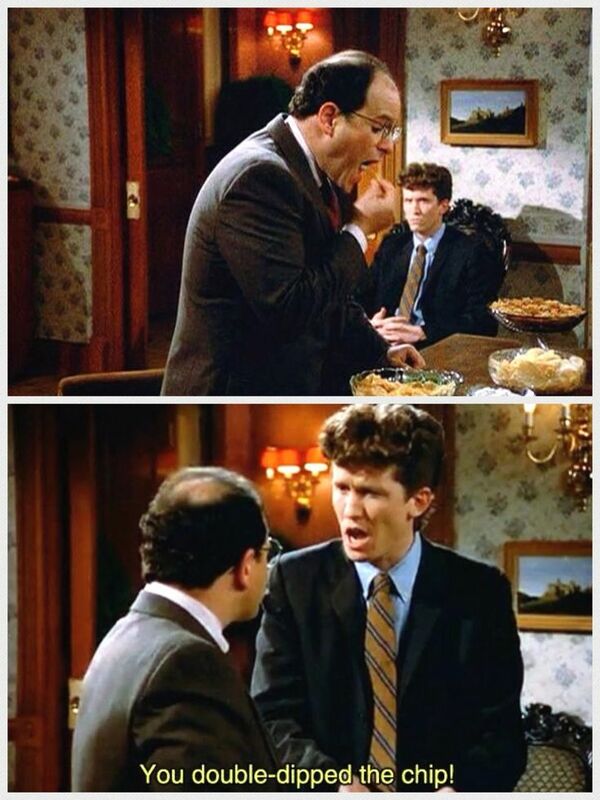 Personally, I think it is very likely that double-dipping adds bacteria to the food, since a person makes contact with the bacteria in their mouth and proceeds to put it back in the food. Researchers at Clemson University set out to determine if double dipping adds germs and bacteria to food. The study was composed of three separate experiments to determine this answer. One of the experiments they performed had eight people submerse crackers into water, with some taking a bite prior to dipping, in order to see if double dipping alters bacteria levels. After this experiment was performed, the concluding data shows significantly higher levels of bacteria when the cracker was bitten before dipped as opposed to the others who did not bite it prior to dipping it into the water. A “P” value is provided in the abstract of this experiment and is less than 5%. This means that given the values of the data, it is very unlikely that these results are a fluke, although they could still be due to chance. Initially it stands out to me that this particular experiment only had eight people in total, which reduces the reliability of the experiment. The second experiment performed on this subject was similar, but tested the pH of common dips that are victims of double dipping- including salsa, chocolate sauce, and cheese sauce. The results remain consistent with the first experiment: there were higher levels of bacteria in the double dipped solutions than the untouched solutions. Although, the salsa had more bacteria than the chocolate sauce and cheese sauce solutions. This could either be a fluke or an experimental error, but there is no mechanism provided for why the salsa has higher bacteria. These experiments were two of three performed in this study in order to find out whether double dipping makes a difference in bacteria in food or if it’s not a big deal. The third experiment was very similar to the second experiment, with consistent results as the preceding two. This is the only study I could find that had a reliable design. Although, the study could have been larger, the results remain consistent with my hypothesis that double dipping adds bacteria to a food dish. Although the study concludes with elevated bacteria levels in double-dipped dishes, these are soft endpoints because it would only increase the level of bacteria in the food, which people believe could make them sick. Bacteria is everywhere, so there is no way to avoid consuming bacteria even if you do not double dip because there are many other ways these bacteria can be spread (e.g. coughing). With this study, the null hypothesis, that double dipping does not increase bacteria levels in food, is rejected due to the increase in levels of bacteria. To summarize, double dipping does add more bacteria to food than is already there. In the end, it is not worth it to double dip because although you may not be affected, those who come after you will be affected also. Not to mention someone could have double dipped before you got there! This entry was posted in Uncategorized on October 17, 2016 by Lydia A Chelli. When I was in middle school, chewing gum was not allowed because the teachers and staff believed it was a distraction to our learning environment. It became an issue when students would stick their dried up, flavorless gum underneath the desks, so that privilege was taken away from the entire student body. The only time of the year gum was allowed at school was the week of the state-wide testing. I was curious as to why this “distraction” be permitted during a time when we’re supposed to have complete focus and concentration. Apparently, there was a correlation between gum and concentration that I was unaware of at the time. A group of psychologists from Saint Lawrence University wanted to learn more behind the correlation between gum and concentration. In order to learn more, the scientists performed a randomized control trial, by giving 80 students chewing gum and another 80 students nothing. Then, the 160 students went through a series of memorization and logic tests, in order to see if there was a difference between the results of the two groups. In the end, the psychologists noticed a large gap between the two groups, in that the chewing gum group did substantially better than the non-chewing gum group. This was tested for multiple trials and the results were consistent. When I was little, bubblegum used to be my favorite snack- yes I would eat it. This quickly ended when my sister warned me that it would take years for the gum to pass and it would mess up my body. This has been an ongoing myth for quite some time, so what is the answer? How long does it take chewing gum to pass through a human’s system? According to the BBC, if someone habitually swallows gum, it can pose a threat to one’s health by building up in their system and creating potential for a blockage. Although, it should not be a worry if it is only an infrequent occurrence. So how may this apply to your life? Well, if you’re very nervous or have to cram for an important test or exam, chewing gum may help you pinpoint some of that anxious energy towards the work that needs to get done. It may not work for everyone since every person is different and has different habits and study techniques, but it is worth a try. There will be no harm in trying to implement this into your current study routine, as long as you don’t consume too much of it! This entry was posted in Uncategorized on September 15, 2016 by Lydia A Chelli. Can your morning coffee can affect your night’s sleep? With the stress of a busy day and a busy life, everyone could always use a break. Everyone takes a nap once in awhile. For college students, parties and late-night study sessions will throw off student’s sleep schedules, causing them to barely make it through their next day’s classes before going back to their dorm to take a nap. But, do these naps account for the hours of sleep lost? How does this lack of sleep affect the way we learn in the classroom and perform outside of the classroom? Will coffee do the trick? Let’s find out. According to the American Psychological Association, a study performed by a University of Michigan student, Jennifer Goldschmied, proved that naps can decrease irritation and rashness, or the likelihood to do something unusual without thinking. These often take place when people are grumpy and sleep deprived. In this study, 40 people were randomly allocated into two groups: nappers and non-nappers. The nappers would nap for an hour during the day and the non-nappers would not take a nap that day. After the day, all people from both groups were tested in order to find out if naps improved a person’s condition. So, how would this affect a college student? This study would be more relatable to college students if the focus and concentration of the subjects was tested at the conclusion. Also, variables such as age and time of the naps could have also affected the study. So, how much sleep is enough sleep? 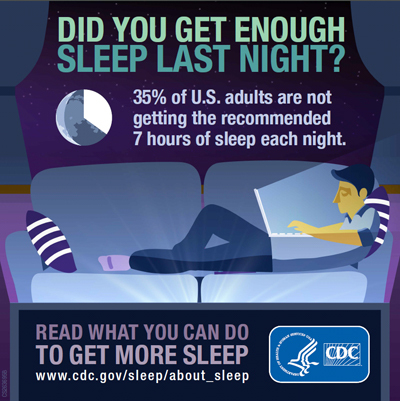 According to the CDC in the image below, adults are urged sleep at least 7 hours a night. Of course, this depends on many factors, including someone’s job and workload, but I know that with 7 hours of sleep a night I still do not feel rested after a long day. In order to compensate for what feels like a never ending day, most students and adults will turn to caffeine in order to get them through their day. In order to see how caffeine affects sleep, there was a study performed to see that randomized patients and gave half a placebo pill and half a caffeine pill in order to see if or how sleep was affected. The study concluded with information that caffeine will affect the quality and quantity of your sleep, even if consumed in the afternoon long before bed. So, an occasional morning cup of coffee is okay if you want to start your day. It isn’t a secret that most people, including college students cannot start their day without coffee or their day hasn’t begun until they drink coffee. If you are someone who knows that you cannot go a day without coffee, then try to leave it to the morning. Since coffee consumed at any point in the day will affect your sleep for that night, it is best to consume it as far from this time as possible, in order to make the most out of the much needed sleep. Can dance save your life? The first few weeks of college, especially for a freshman, can be very difficult to adjust to. With new clubs, sporting events, making friends, new campus, and classes, everyone definitely feels an increased level of stress. As everyone knows, there are many more causes for stress than being thrown into new situations; in fact, problems mostly arise in familiar places such as home and the workplace. 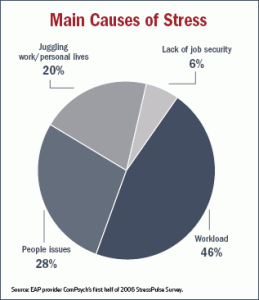 According to the chart below, stress resides in the amount of work someone has to do, on top of other priorities, but there never seems to be enough time. When I feel stressed, I enjoy listening to music in order to take away or distract from whatever is on my mind. According to the University of Nevada , music can provide a substantial increase in someone’s mood. Of course, there are certain genres of music that can affect how accurate this is, but it also depends on the preferences of the person listening. For example, it is not guaranteed that music that relaxes someone’s friend will have the same impact on them. So we know that music can be used as an escape from stress, but does dancing provide the same relief? According to Christina Devereaux, dancing does provide additional stress relief and creates a more positive state of mind. In her article, she describes a study in which high-stress patients were in four groups and each had to attend a certain class in order to see if or how their stress was affected. The dance class, out of fitness, math, and music, stood out as greatly decreasing the stress of those who attended it compared to the other classes. Due to the testing of third party variables to see if that affected the data, I would consider this data evidence that could be used to prove the positive affects of dancing on stress. With the pressures that come from homework, jobs, and commitments like clubs and sports, it’s hard to find time to relax especially when there are so many distractions from social media. As a college student at a campus as big and exciting as Penn State, it is essential for students to consistently take breaks from homework, electronics, and all other distractions and do something healthy to give their minds and bodies a rest from their 24/7 schedule. So, there is no proof that dancing can save your life, but since it can reduce stress, it would be good to find time to relax and listen to music or dance. It is common knowledge that stress can lead to health problems in the future, so why not avoid it now? Hello, my name is Lydia! I am a freshman from Connecticut and I am currently in the Smeal College of Business here at Penn State. I, like many of you, have had a rough relationship with science over the past few years and I am very excited to see what this course has to offer. While trying to finalize my schedule, I began searching the science classes for one to fulfill my general education requirement (like the majority of people in this class). Through personal experience in high school, I did not have a desire to know most of the topics we were learning about in my science classes. Surprisingly, not once have I had to determine if a rock was igneous or sedimentary since my freshman year Earth Science class. 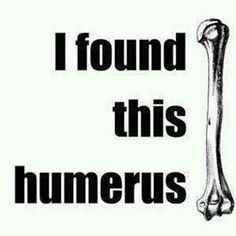 Likewise, I haven’t had to list out the bones in the human body since Biology three years ago. I understand the importance of knowing these things about the way the body and the world around us works, but it’s delivery has been so boring. So, when I had to select a class, I couldn’t find one that didn’t remind me of my previous lousy experiences. When I came across SC200, I chose it right away because I was super excited to finally have a new, more interesting science experience. The focus on discussion and critical-thinking instead of labs and facts appealed a lot to me. In the end, I decided to take this class because I enjoy the idea that the students can have a say in what we learn about taught by a professor who wants us to learn. Due to my poor experience in science from middle school to high school, I was never interested enough to continue to study and major in it. Since I never had a creative and thought-provoking experience in my science classes, I preferred to major in business in order to use those skills. I know scientists use these skills as well, but the classes I took all revolved around facts. Even though I will not major in science, I look forward to taking this class because I hope it can improve my critical thinking skills while learning about the interesting ideas found through science. If science is taught the right way, it can be very interesting to students and can easily become their favorite subject. Since science is not a very common major these days, I was thinking if the way science is being taught in schools has affected the “reputation” of the science major. This article raises this question: Why are science majors decreasing in popularity, and should we high school educators accountable for this? From past experience, I think the way science is taught in schools makes it seem boring, but it is actually very cool. Although each school has strict curriculum, teachers should give students more of a chance to communicate what they find interesting and want to learn about. Since that is how this class is taught, I am hopeful that this class will give me a renewed sense of appreciation and curiosity for science. I am very excited about what this class has to offer. I will continue to do research on subjects that relate to my everyday life in order to see if we can discuss them during class. I enjoyed listening to some of the topics brought to attention in class. To me, one of the most interesting (yet not as important) topics is the flossing controversy. Here is an article by the BBC questioning whether flossing really does provide benefits. I am very excited to discuss this topic more in class. I look forward to this semester and also to learn about the interesting and important topics! This entry was posted in Uncategorized on August 29, 2016 by Lydia A Chelli.